Behold & Reflect: Asking Myself: Why are you afraid? 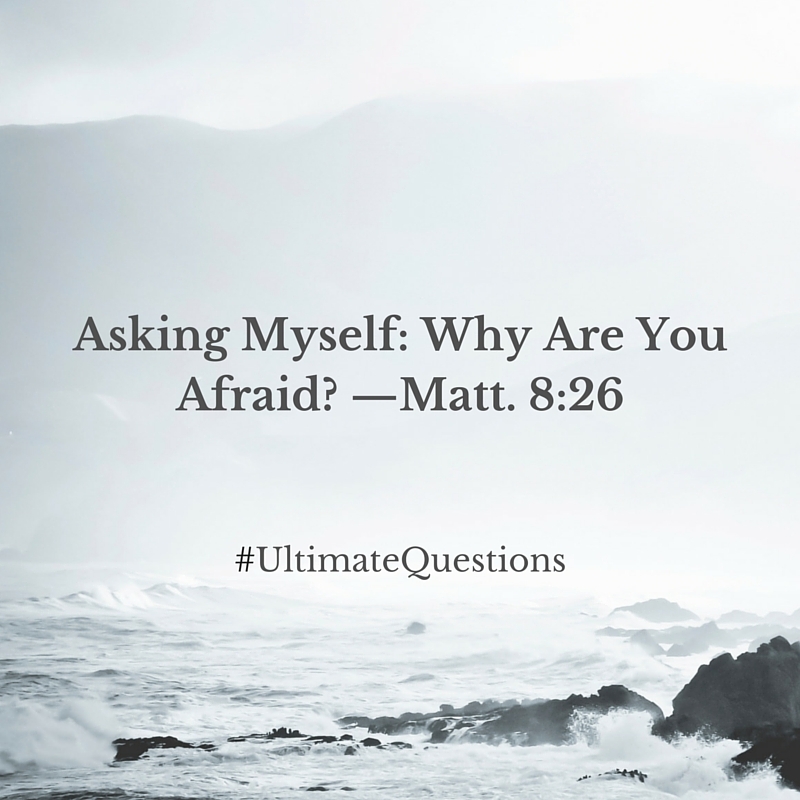 Asking Myself: Why are you afraid? This is the tenth post in my series "Asking Myself," in which I weekly ponder one question posed in Teresa Blythe's rich book, 50 Ways to Pray. You can find the start of the series here and last week's post here. This week marks a shift from theological musings to reflection on the specific questions Jesus posed in the New Testament. To give some context to this red letter question, this is Jesus' waking response to his waterlogged disciples after they roused him from his nap with a frantic weather update. A storm is brewing! We don't want to sink! Help us dump all this water out! How can you sleep through this deluge? Can't you see, all is nearly lost?! I don't know the tone in which Jesus replied. I almost imagine a groggy Savior. After all, in the verses before, he'd just told a wanna-be disciple that to follow Him meant having no place even to lay one's head. And with that adieu, Jesus boarded a dinghy and collapsed into sleep, head on the damp splintery bottom, overtaken by his unending, crowd-pressed exhaustion. "You have so little faith." As I ponder Jesus' question, I cannot ask it of myself, without what seems to be Jesus' "hint" to us about the root of being afraid. Therefore, before I can ponder my deepest fears, I must address the matter of faith. As usual in these posts, from one question springs forth dozens more! What exactly is faith? Is it absolute certainty? Simple mental assent? Hopeful thinking? Can there be any fears if there is faith? Are we even able to have faith? Is it humanly possible? And if fearlessness is based on it, does that encourage us to be close-minded, to keep ourselves away from questions that might endanger our current beliefs? And if so, doesn't this posture make us vulnerable to the enemy's lies? I'm getting way ahead of myself! Back to Jesus. Earlier in Matthew chapter eight, Jesus praised the Roman officer for implicitly trusting that Jesus' authority meant he could "just say a word from where you are, and (his) servant will be healed." Jesus responds by making the centurion an example to the Jews, then says, "Go back home. Because you believed, it has happened." The context of both these "faith" stories troubles me when I try to simply parse out Jesus' question about being afraid. Within the context of Jesus' larger narrative about faith, it seems almost a rhetorical question. Why do I fear? Because I lack faith. I lack trust in the complete control and complete goodness of Jesus in my circumstance of need, just as the disciples in the sinking boat. In my desperate moments I do fear. I do lament my lack of control. My set of irrational phobias spring to mind. If you must know, my top three are eyeballs (so delicate!! ), throwing up (so uncontrollable!) and swallowing pills (what if I gag and choke and it never goes down?!) Gasp! I started having anxiety issues in my early 20s, less now because I've learned to control the tremors with breathing and relaxation techniques. And yoga. And the occasional emergency Xanax. So, I am acquainted with stormy fear. But beyond those times of obvious terror, I don't always trust Him in guiding my life's general direction. It seems the disciples had one up on me in this arena. Before even shoving away from shore, they'd heard the cautionary tale about the costs of following Him: No place to lay your head. Your dead will bury their own dead (Matt. 8:19-22). Basically, they'd be cut off from all the physical and familial comforts they'd ever known. But they still got into the boat. And, I think most of the time I do associate with being in Jesus' boat. But I'm not in a storm and none of my loved ones are deathly ill, nor do I need to bury anyone, nor am I pillowless or homeless. If I were to describe my life in boat metaphors, it would be more of a quiet drift, with slack in the sail thwacking the canvas one way and then the next. Shifting winds, but not too gusty. Not enough to prevent mosquitoes and sand flies from catching up to the boat and biting. On the horizon, a barely perceptible gradient between sky and sea. Behind me, the shore seems to be getting no farther nor nearer, just bobbing slightly. For me, this is a fearful thing. I fear missing the mark with my life while things are so calm. I'm afraid of coasting my whole life, of never truly discovering or investing my talents. Of missing the "Well done, good and faithful slave" at the end of it all. And, if I can't seem to do much with what little I have in these quiet days, I fear being unprepared in faithfulness for when times get stormy, as they invariably do. I've been very abstract up to this point. I have a more concrete confession to make: These last couple of weeks have felt heavy as I've considered the direction of my life as a hodge-podge freelancer, mostly-at-home mom whose youngest is approaching school age. In these last two weeks, I've imagined pursuing no fewer than 11 different possible careers. As in, journalist (which I'm trained to do), blogger (which I do for fun), children's book author (which I did once), non-fiction author (which I aspire to be), grant writer (which seemed like a better use of writing skills), researcher (because there's so much we don't know yet! ), book editor (because those who never get around to writing their own books are certainly qualified to critique others'), ecumenical organizer (which I want to be when I read too much Bonhoeffer), conservationist/naturalist (which goes back to my undergrad major), non-profit starter, social worker (which is where they walk the walk), zoo educator (because it would be so much stinkin' fun), environmental lawyer (because its totally out of my reach), urban planner (because I almost did that), spiritual director (because I love thinking about spiritual things) and counselor (because I long to be useful). That's 15. I've considered going back to school and into debt for several of the above. And I still haven't landed yet. So, why am I afraid? I am afraid because I'm approaching 40 and I still don't know what I want to be when I grow up... other than I want to be creative, I want to solve problems, I want to do good for a cause in which I believe, and I want my three sons to be proud of what their mama does. I'm afraid that maybe no pursuit will match these aspirations. Or, that the career exists, but it won't want the likes of me. And I fear God might not really be in control this time around. Yet, if I'm honest, if I remember right, the dawning, fresh-as-dew moment that initiated this job search was a joyful one. I woke up one Monday morning feeling God's still small voice echoing in the chambers of my soul, Emily, it's OK. I trust you to do a job you like. Go ahead and choose one, pursue one, then do it unto Me, with Me, gazing at Me. Just so you know, I don't hear God's voice audibly, but I sometimes "hear" impressions, and this one was indelible. It made me buoyant, even in the bustle of getting kids out the door for school and wiping noses and butts, I was really energized by the thought. So maybe having faith is taking note of those moments of clarity, those Emmanuel mornings, and trusting that direction, working steadily along that course. Maybe its taking more stock in and identifying with those sacred moments rather than in the sea of scared moments. I can't conjure up faith. But my faith grows in the light of His presence. And I do have control over how much time I spend seeking His face. I have control over how much I choose to obey His voice. Maybe faith in a case like mine is to press through the afraid. Very practically, to keep looking into possible careers, with the aim of making a decision, with the intent of pursuing it, with a posture of hopefulness rather than helplessness. Next week's question Jesus asks: What is it you want me to do for you? Jesus Asks: "What do you want Me to do for you?"